Down from the skies come U.S. Paratroops. A new American fighting force in this war, it is natural they should need a new firearm. And just as natural that is to be originated, engineered and designed by Winchester! This Winchester Carbine, officially called the U.S. Carbine Caliber .30, M1, weighs a little more than one-half as much as the standard service rifle. It’s greater in fire power, longer in range, faster in action and more deadly in accuracy than the automatic pistol. Reliance upon Winchester gun-making craftsmanship is natural to Americans. For perhaps nothing which has ever been made in America has been so much a part of our nation’s history as Winchester guns and ammunition. Look at the record: In 1866, the Winchester Model 66, the world’s first commercially successful repeating rifle, was born. Men swore and lived by it. In Mexico, it helped Juarez break the despotic yoke of Maximilian. A few years later, the Model 73 became as renowned as the heroes of the Western plains who lived by it. In the Spanish American War and World War I, Winchester fought for America. 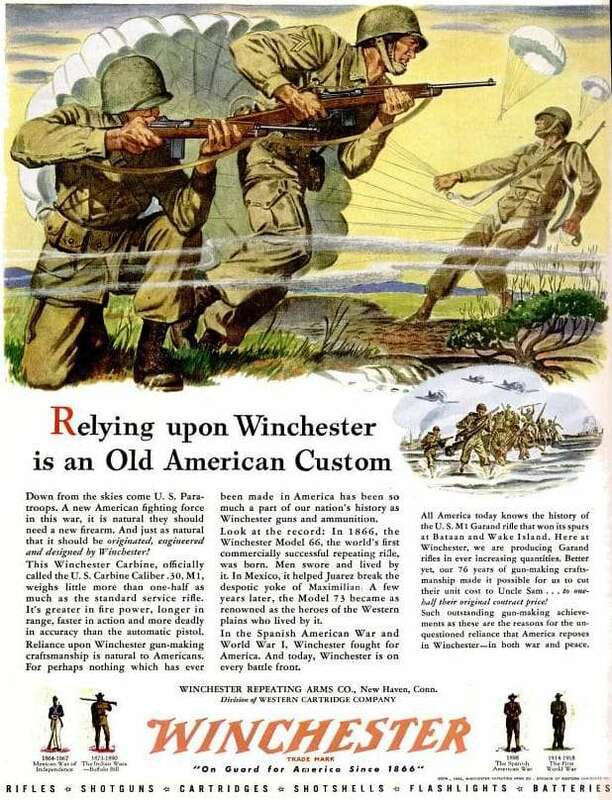 And today, Winchester is on every battle front. All America today knows the history of the U.S. M1 Garand rifle that won its spurs at Bataan and Wake Island. Here at Winchester, we are producing Grand rifles in ever increasing quantities. Better yet, our 76 years of gun-making craftsmanship made it possible for us to cut the unit cost to Uncle Sam… to one-half their original contract price! Such outstanding gun-making achievements as these are the reasons for the unquestioned reliance that America reposes in Winchester ­– in both war and peace.